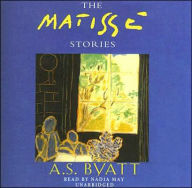 Only three short stories in this small volume – The Matisse Stories – by A.S. Byatt, with each story revolving around a Matisse painting. Each includes a feminine protagonist pushed to her limit. The women are ordinary at the beginning – an older classics professor and her hairdresser, an overworked mother and her housekeeper, and a college dean with the task of deciding the fate of an erratic doctoral student. The beauty of Byatt’s writing is the familiarity of the circumstances that morph into crisis mode. in “Medusa’s Ankles,”when the professor is sitting in the chair listening to her hairdresser, you may recall your last conversation with yours. Most likely, though, your hairdresser was doing the listening. In Susannah’s case, her patience snaps when she is faced with a redecorated salon and a substitute messing with her hair. Ironically, the hairdresser sublimely sees Susannah’s extreme action as a sign to move on – perhaps to another career. In “Art Work,” Mrs. Brown, the housekeeper, patiently observes her frantic overlords – a woman trying to juggle career and family as the primary breadwinner, with an artist husband who thinks too much of himself and his untalented work. In the end, Mrs. Brown launches her own artistic sensibilities into a lucrative career, and perhaps motivates her former boss to finally follow her own dream. The last story, “The Chinese Lobster,” focuses on a luncheon conversation between the graduate dean and the advisor of a doctoral student in art, whose final project has drawn criticism and the possible end of her pursuit of a degree. In retaliation, the graduate student has filed a complaint against the advisor, who adamantly holds that the student is incompetent, does not appear for classes, and does not complete requirements – all true. The standoff is now in the hands of the dean, who is trying to convince the advisor to pass the student on, forget about her, give her the degree, and move on, to avoid the trauma of a long investigation. At first, the advisor is appalled, but in the end proclaims: “At the same time, exactly at the same time, I don’t give a damn…” – unfortunately, a situation I have seen in my own experience many times.